Place the eggplant, capsicum, ocean jacket cheeks, olive oil, oregano, lemon zest and a big pinch of salt and pepper into a mixing bowl. Toss to combine. Preheat a griddle pan or frypan over high heat. In batches, place the eggplant and capsicum into the pan in a single layer. Cook for 3 minutes on each side, or until tender. Once all of the eggplant and capsicum is cooked, place the Ocean Jacket cheeks in the pan, and cook for 2 minutes on each side. 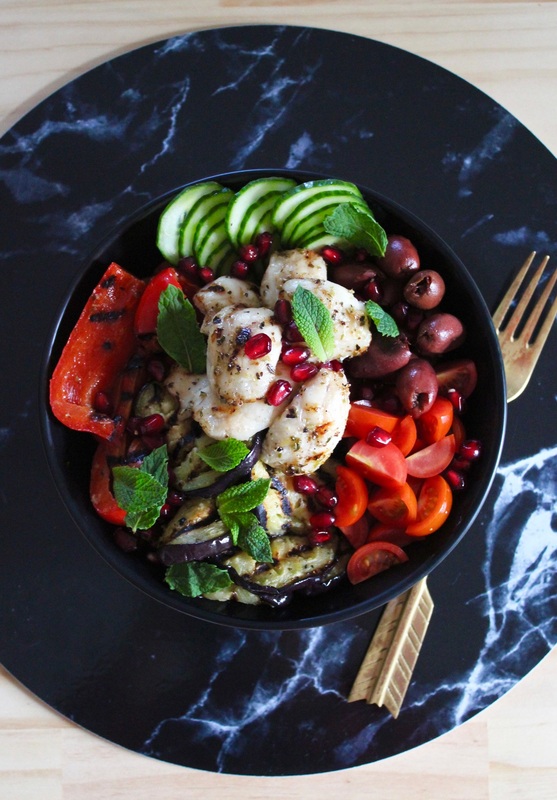 To two serving bowls, arrange the eggplant, capsicum, olives, cucumber and cherry tomatoes. Top with ocean jacket cheeks and pomegranate seeds to serve.